Inexpensive, low density material (0.93), LDPE is flexible. It is used for various applications in dip tubes for the cosmetics and medical sectors, is suitable for food contact and, in some cases, complies with Pharmacopeia requirements. It is highly resistant to impacts and offers good dielectric properties and good resistance to chemicals, particularly alcohols and solvents. However, it cannot be used for temperature applications and is sensitive to UV. It can be coloured easily. It is suitable for food contact and, in some cases, complies with Pharmacopeia requirements. It has very good impact resistance properties, a low friction coefficient and good dielectric properties. It is also extremely resistant to many chemicals. However, it is sensitive to stress-cracking and UV. It can be coloured easily. Inexpensive, low density material (0.90) PP is rigid with a flexural m odulus of 1,300 MPa. PP is particularly resistant to bending (hinges), and shows good resistance to many chemical agents. Its temperature resistance is higher than that of Polyethylenes, but it is too fragile for cold use. It shows low permeability to water and water vapour. It is easily coloured and is often used for toys. There are many versions of PP with different rigidity and transparency properties. PP copolymer has better impact resistance, PP homopolymer better rigidity. This rigidity can be further improved by adding mineral fillers. This material is very widely used in extrusion because it is relatively easy to transform, is inexpensive and available in various grades. We transform flexible PVC of 60ShA hardness to 42Sh.D hardness in transparent and easily coloured versions. We also transform rigid PVCs, both transparent or natural ivory colour, suitable for food contact or not, as well as chlorinated PVCs. The combination of flexible / rigid PVC is often used in co-extrusion. Depending on its hardness, the density of PVC varies from 1.25 for the most flexible to 1.45 for the non-plastified grades. PVC offers good resistance to many acids and bases but is sensitive to solvents. Depending on its grade, it can be used up to 80°C in continuous use. Rigid material, good wear and impact resistance, a low friction coefficient. Can be used up to 80°C in continuous use. 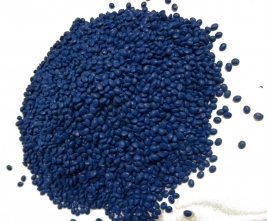 Polyamide 6 offers good fuel resistance. However, it absorbs ambient humidity which can result in the modification of its mechanical and dimensional properties. The properties of this material are quite similar to those of PA 6. However, it has better mechanical properties and can be used up to 100°C in continuous use. Like PA 6, it absorbs humidity. Density 1.14. It can be modified to improve its tenacity or reinforced with fibreglass to improve its mechanical properties. Rigid material with very low friction coefficient and good wear resistance; it is widely used in mechanical applications. Unlike Polyamides, it absorbs little humidity. It can be used up to 100°C in continuous use. It offers good resistance to fuels and solvents but not to strong acids and bases. It is difficult to glue. POM homopolymer offers better mechanical properties and temperature resistance than the copolymer version, which offers better resistance to chemicals and hydrolysis. There is no fireproof version. Flexural modulus of 2,600 MPa. Density 1.42. The main property of Polycarbonate is its excellent impact resistance. It is transparent. It can be used up to around 120°C in continuous use. It offers little resistance to chemicals and hydrolysis. It offers good electrical insulation properties. Flexural modulus of 2,350 MPa. 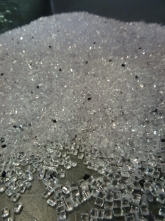 Density of Polycarbonate 1.20. This material is easily extruded. It can be used up to approximately 70°C in continuous use and offers good impact resistance at low temperature. It is scratch-resistant and offers a good colour rendering. However, it is sensitive to outdoor exposure. This fluoropolymer is rigid, offering excellent resistance to UV and many chemicals, as well as a high level of impermeability to gas and liquids. With no mechanical constraint, its continuous use temperature can reach 130°C. Flexural modulus of 2,100 MPa and density 1.78. This rigid material offers temperature resistance to 180°C; it is self-extinguishing with low fume emission. Its natural amber colour is not ideal for colouring. Density 1.27 and flexural modulus 3,200 MPa. This rigid material can be used up to 260°C (continuous use) with a high level of tenacity; it offers good dimensional stability but limited impact resistance. PEEK offers good resistance to solvents, hydrolysis and high levels of gamma radiation. PEEK has a density of 1.3, and flexural modulus of 3,000 MPa. TPU, TPEE, TPV, EVA, SBS, SEBS, etc. It is therefore difficult to characterise an entire family in just a few lines. By discussing the properties a client expects of his/her product and its operating conditions, we can define the most suitable material.